Once upon a time there was a little boy named Matthew Thomas Bell who had a very wild imagination. He would make up lots of wild tales, that no one could believe. Matthew Thomas had trouble getting people to believe him, even when he was telling the truth. Because of his story-telling getting out of hand, you understand. His parents would tell him, "Matthew Thomas, if you don't stop telling wild tales, one day you're really going to need someone to believe you,and they won't. And that could be a very big problem." Well, just the other day Matthew Thomas's mom had to call him for breakfast twice, (he was always so slow in the morning). Mom had his breakfast cereal out and although Matthew Thomas was the only one who hadn't yet eaten, the table was set with two bowls and two glasses of juice. She knew the routine.There had to be two settings at the table, even though she and his dad had already eaten and he was the only one left. That's because Matthew Thomas insisted to his mother that his friend always joined him for breakfast. Nobody else could see Matthew Thomas's friend, but there still had to be two table settings. It was a little thing, and it made him happy, so she did it. Matthew Thomas came bounding down the stairs to breakfast, skipping steps, jumping over one step to the other. Matthew Thomas knew better than to do that, of course. He had been told. "You could fall and break your leg young man!" more times than he could remember. Looking back over his shoulder he waved a come on down to thin air. And then Matthew Thomas stayed at the bottom of the steps, counting them down, as if he were waiting for someone to join him. Then it looked like he hooked his arm through another's, and he skipped all the way to the breakfast table. Then he sat down to eat. Mom sighed and put her hands on her hips, and said "Matthew Thomas I've told you a hundred times not to jump down those steps that way. You had better stop doing that before you end up breaking an arm or a leg. "Matthew Thomas replied, "But Mom... Art does it." Matthew Thomas's mom answered, "Well Art is simply going to have to stop showing you things you shouldn't do. Now hurry up and eat, so we can go shopping today." "Oh Boy!.. Hurry up Art," said Matthew Thomas, and he dug into his cereal. Matthew Thomas's mother reached over and brushed his hair away from his face. She said,"Now suppose we leave Art at home today. We have a lot to do." Matthew Thomas looked sad, and said, "But Mom, Art will be lonely, all by himself." "Art will be just fine by himself." Matthew Thomas suddenly got a mischevious grin on his face, so his mom suspected he must be up to something. In the car, on their way to the store, Matthew Thomas kept looking around to the back seat and making faces. "Sit still, Matthew Thomas! What are you doing?" "Mom ----- Art's making faces at me," he said. "Matthew Thomas," scolded his mother, "I told you to leave that troublemaker at home today. If it wasn't for us being so late I'd turn this car around right now, young man, and we'd just go home." In the clothing store, Matthew Thomas was running in and out of the racks of clothes, and causing a lot of confusion. Matthew Thomas's mom told him, "Unless you want a spanking right now, you had best stop it and behave yourself right this minute!" Matthew Thomas whined, "But Mom... Art's chasing me!." "That's enough now," she snapped. All through the rest of the store, Matthew Thomas behaved himself. But when they got to the grocery store, Matthew Thomas's mother made him ride in the cart. "This way I can keep an eye on you," she told him. She let go of the cart for a moment and was looking over her list, when all of a sudden Matthew Thomas and the cart went whizzing down the aisle. Matthew Thomas's mother went tearing after him and grabbed the cart, and wouldn't you know it, Matthew Thomas shrugged and pointed at thin air and said, "Art did it." They passed a huge stack of cans, and as she stopped the cart by it, several cans rolled across the floor. His mom yelled. "Matthew Thomas!" and she apologized to the aisle manager, standing there. He said, "Its ok, Ma'am... Boys will be boys you know." As she was trying to finish up her shopping, she vaguely registered the fact that there was more stuff in her cart than there should have been. Too busy to think about it more, she went on. At the egg display, a dozen eggs got knocked off the counter, and landed with a messy plop on the floor. Matthew Thomas looked embarrassed but told her, "It wasn't me. Art did it, Mom". When they came to the check-out counter, Matthew Thomas's mother discovered she had more bags of chips than she remembered getting, because she only meant to buy one. Curiously, there were more cookies and pizza too, but rather than hold up the line she went ahead and paid for them anyway. When they got home, after helping his mother carry the groceries in, Matthew Thomas went back outside to play. Matthew Thomas's mother had just finished putting away the groceries, when Matthew Thomas popped in, yelled "Help!" and then ran back outside. She went tearing out after him,wondering what was the matter. Matthew Thomas was standing under the big apple tree, looking up in the branches, and crying. "Mom, Art's stuck up in the tree, please help him down," and there were big tears in his eyes. "You gotta help him Mom, you gotta." To satisfy her worried boy, she got the ladder out, put it up against the tree and started climbing it. She was going to help get Matthew Thomas's imaginary friend down from the apple tree. The gas man came to read the meter and said. "What's wrong Mrs. Bell, need some help?" Embarrassed, and not knowing quite how to explain what she was doing up the tree, she replied, "Just checking the apples, thanks anyway." Then she shook her head, wondered what on earth she was doing, and climbed back down, out of the tree. As she started to put away the ladder, Matthew Thomas yelled "Mom, wait!...he's not all the way...Oh NO! Art fell out of the tree, Mom! Quick, help me carry him inside!" So Matthew Thomas's mother had to help carry Art inside to the couch, all the while feeling very silly, since she certainly couldn't see whoever it was she was supposed to be carrying. Matthew Thomas ran and got a cold cloth and rubbed a spot in the air over the pillow, where Art's head would be, worriedly asking her, "Is Art going to be ok, Mom?" His mother reached over and stroked the air where Art's head was supposed to be. "I'm sure he will, son. Let's let him rest, and we'll go eat lunch." Later that day while Matthew Thomas's mother was busy in another room, she heard a loud crash which sounded like it came from the living room. She dropped what she was doing and rushed into the living room. The ceiling fan was still swinging back and forth, and a lamp lay in pieces on the floor, with a basketball beside it. Matthew Thomas, eyes wide, was standing off to one side. Matthew Thomas's mother was really angry. "Matthew Thomas!!" she yelled. "You've been told not to play ball in the house, young man! Now look what you've done. You march yourself up to your room and you think about all the trouble you've caused today!" Matthew Thomas stomped upstairs, hands in his pockets, head hung low, but as he went, he called out over his shoulder. "I didn't do it Mom. Art did it. He was swinging on the ceiling fan after I told him not to." 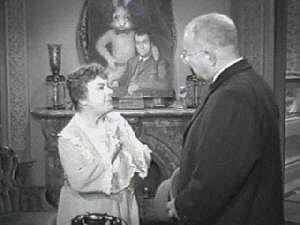 "Chimpanzees swing from the ceiling young man, not little boys. And while you're up there, suppose you just think about all that story-telling too!" his thoroughly annoyed mother called right back. Matthew Thomas spent the rest of the afternoon in his room. When his dad came home and called him down to dinner, Matthew Thomas forgot his last stair jumping scolding as usual, and ran jumping down the stairs, this time carrying with him a sharp pair of scissors. "Don't you run with those scissors, young man!" scolded his mother. "You could fall and poke an eye out." She sighed. "Now do me a favor, scoot over there next to Dad before we eat, and let me get a quick picture of you and your father so that I can send it off with my letter to Grandma after dinner. Matthew ran across the room and grinned up at his dad. "Oops," he said, with a sudden jump. He turned to look at something invisible. "Sure, you can be in the picture too," he said. "Stand right here," and Matthew Thomas moved slightly away from his father to make an empty space between them. Matthew's father looked at his wife and shrugged his shoulders, as if to say "I have no idea what's going on," but he and Matthew Thomas smiled into the camera and Matthew Thomas's mother pushed the button. She was using one of those instant cameras, and she pulled the picture out and laid it aside without looking at it, so their dinner wouldn't get cold. When the family finished dinner, Matthew Thomas asked to be excused from the table and he went dashing back up the stairs to finish his homework. Matthew Thomas's mother straightened up the kitchen after dinner, and absent-mindedly picked up the photo on her way to join her husband in the living room. She glanced down at the picture in her hand and suddenly stopped dead in her tracks. Then she started to laugh and laugh. Her husband looked at her strangely and asked what was so funny. Matthew's mother couldn't stop laughing, so she just handed him the picture she took of Matthew Thomas and his father, right before dinner. Matthew Thomas's father looked at the picture and scratched his head. In the picture were Matthew Thomas and his father. But standing right between the two of them, and smiling fondly down at his friend Matthew Thomas, was a great big chimpanzee whose name could only have been...Art. Matthew Thomas's rather large chimpanzee friend (whom everyone thought was imaginary), was actually a Pooka. 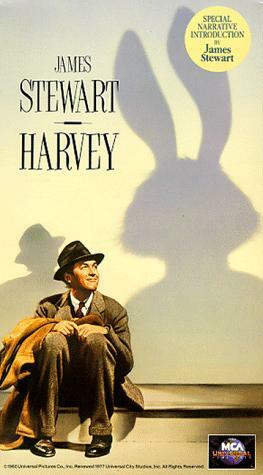 Perhaps the most famous Pooka your family already knows of was named Harvey, a 6' rabbit about whom a play was written and then a movie made, starring James Stewart, as Elwood P. Dowd. It's a perfectly delightful movie, by the way. Pooka: From old Celtic (kel-tick) mythology, a fairy spirit in animal form, always very large. The pooka appears here and there, now and then, to this one and that one. A benign but mischievous creature very fond of rumpots, crackpots, and...."
Ah..yes...thank you for reminding me. It is getting late, isn't it? About The Author: Linda Jo Bell is the proud 48 year old mother of a 5 1/2 year old son, who made his appearance after 30 years of marriage and after being told they could never have children, (which, as she says, is a story within itself). Linda Jo takes care of her own son, as well as the children of some other mothers, she is involved with online auctions, yet she still manages to find time for her writing. Linda Jo has written stories and poems since high school, and several, including "Imaginary Friends" have been based on the pooka, Art. The stories originally came about, she tells us, as a result of Linda Jo overhearing a group of children talk about an imaginary friend that only they could see. Curiously enough, these children, as well as another group of children she had come to know, but who lived clear across town, (and had never met the first group of children), all described the exact same imaginary friend who, you guessed it.....looked just like Art. Drop a line to Linda Jo Bell and tell her how much you enjoyed reading her tale, Matthew Thomas, at Bedtime-Story. About REAL Chimpanzees: Chimpanzees are NOT monkeys. No sir. Definitely not. Actually, the chimpanzee is humankind's closest living relative and a member of the great ape family, which also includes gorillas and orangutans. 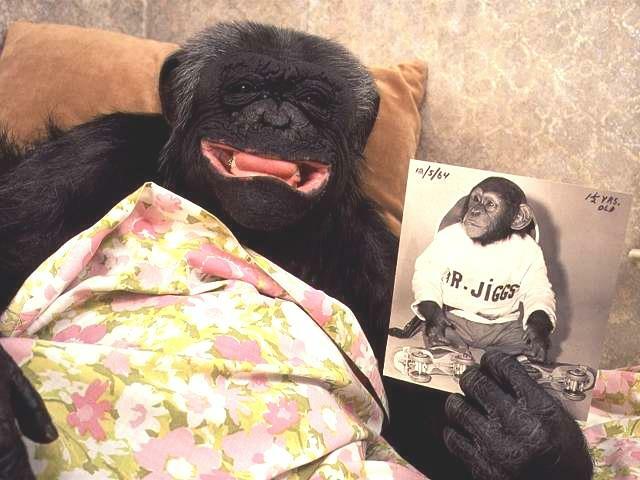 Chimpanzees and humans are "sibling species"--two species that are virtually identical in their genetic makeup. Chimps share 98.4% of human DNA. Wild chimpanzees are indigenous only to Africa, can have a life-span of more than 50 years, and weigh up to 200 pounds. Chimpanzees have demonstrated cooperative problem-solving, the representational use of numbers, and the ability to comprehend and use language, including proper syntax. As with humans, the mother-infant bond among chimpanzees is extremely close. The chimpanzee mother nurses her infant for four to five years. The growing chimpanzee child then spends a prolonged childhood, until age ten or eleven, living with his or her family. Wild chimpanzees make and use a variety of tools for gathering and preparing food. For example, the chimpanzees of West Africa practice a stone tool culture. Their hammers and anvils, used to crack hard nuts, are similar to the tools of our own hominid ancestors. Chimpanzees seek out and use certain plants medicinally, to treat symptoms of various illnesses. Scientists following chimpanzees in the rainforest have been led to a variety of formerly unknown plant species that have pharmaceutical uses ranging from antibiotics to antiviral agents. Chimps are also very expressive and have been taught to use sign language and other methods of communication. Found in West and Central Africa, these lively primates live in large communities of 20 to more than 100, which are often divided into smaller social groups, not unlike a human community. Once plentiful in Africa, chimps have recently been added to the list of endangered species.